Jamaal May is the author Hum (Alice James Books, 2013) and The Big Book of Exit Strategies (Alice James Books, 2016). His first collection received a Lannan Foundation Grant, American Library Association’s Notable Book Award, and was named a finalist for the Tufts Discovery Award and an NAACP Image Award. 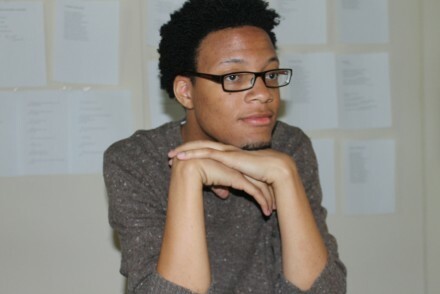 Jamaal’s other honors include a Spirit of Detroit Award, the Wood Prize from Poetry, an Indiana Review Prize, and fellowships from The Stadler Center, The Kenyon Review, and the Civitella Ranieri Foundation in Italy. Jamaal May’s poetry explores the tension between opposites to render a sonically rich argument for the interconnectivity of people, worlds, and ideas. He co-directs OW! 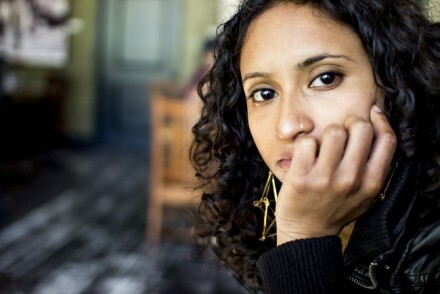 Arts with Tarfia Faizullah. You’re known as an excellent performer of your poems. What are some important strategies and tips for us as we read, recite, and perform our own poems and poems by others? Nerves are always an issue, so it’s helpful to know that poetry can itself be the thing that lets one open up to being in front of people. I suffered from pretty crippling social anxiety growing up, but figured out how to be ok with people and share in front of them through poetry. The trick I learned early was that I didn’t have to engage the audience; engaging the poems and thinking about every word on the page and why it’s there creates the conduit that people can connect to. No one comes to a poetry reading to hear me. They come to hear the poems. Once that lesson is embodied, a lot of the pressure goes away. Your only job is to give the words their due. A great reading is the audience watching someone be vulnerable enough to get out of the way of the words they wrote and let them stand. The music and pacing is already there and will pull you along as long as you don’t fight it. Stop at periods, pause at commas, and inflect as if the speaker in the poem is a person and not a disembodied voice. I consider an unwaveringly monotone reading to be much more performative than what I do, because to accomplish such a feat, one has to lose all sense of how they actually talk to other people. Don’t be afraid of your voice cracking or losing your breath or your place on the page. People will always resonate with clumsy sincerity more than polished disconnection. How are poems different when read silently and when read aloud? Do you think poems require, in some sense, activation by the human voice? The primary difference is basically a question of acoustics. Our minds act like resonating chambers that translate what sounds come in. The same thing happens whether the sound starts with the ears or in the mind, but it will sound different. Reading alone silently is like kicking it with yourself while a chamber ensemble plays in your living room. A public reading is like hearing the whole orchestra in a huge hall. Both can be intimate experiences, but the public reading takes an emotional investment on the part of more individuals to create that feeling of intimacy. The sounds themselves are different based on everything from the shape of the room to how waveforms bounce off of the people sitting there. Reading silently can be more personal because the voice resonating in the chamber is one’s own construction, even if you are imagining the poet’s voice at the same time. In both scenarios, what the recipient is looking for is a participatory experience. At home the mind participates by generating its own soundscape and in public, the mind participates by translating the vibrations that come in. There’s also an intangible, almost metaphysical aspect to what happens when groups of people share in the same cultural experience together. Reading aloud alone is an underrated hybrid experience that can be extremely powerful as it generates many of the effects of both. I think all three experiences have their joys and we’re really fortunate to live in an era where we don’t have to pick. Do you think about the performance of a poem as part of your writing process? I don’t think about performance at all. Ever. I just try to read my words the way they’re written. If they feel or sound clumsy in my mouth, then they aren’t written as deftly as I’d like. The secret to being a good reader is to avoid performing. I read like I care about what I’m saying because I actually do. It can’t be faked and we all know when we’re watching someone perform the pants off something they don’t believe in or, more commonly, forgot they believed in while they were trying to figure out how to nail a performance. The poems I recite by heart were learned because I edit until every line feels memorable to me. By the time a piece has gone through several edits over years, I should kind of know it to some degree. If it still feels foreign every time I see the poem, it’s probably got a lot of throwaway lines, bad transitions, clumsy sonics, or uninteresting ideas. I do read my poems out loud as I’m writing, and these days, poems will change a bit if something feels off at a reading. A poem can do a lot of different things and I try to make sure they’re all doing as many of them as possible, including how they feel in my body. What various influences do you draw from in your poems, in terms of soundplay and performance? Are there important models for how you perform your poems? Everything I’ve every heard or thought is an influence in the way I think about influence. The notion that our influences are the neat little packages we tend to present them as undercuts the entire spirit of what I’m trying to do. Like I said before, planning a performance would be the death of what I try to give an audience. One can’t use a model to become honest and vulnerable. Your poem, “On Metal,” makes memorable use of sounds in its opening and ends on the word, “silence.” How do you manage sound in a poem? What role does sound play in your drafting of a poem? If I was fussy enough to have an answer to this question, the poems wouldn’t breathe naturally the way they do. I find it helpful to not have a ton of opinions and plans for a poem in the drafting stage. In the editing process I figure out what’s there, why it’s there, and how to deepen the core concern and tighten up the lines. Sound comes into the poems for the same reason birds and stone and light and silence and past loves and dead friends do. All words are just cardboard cutouts standing in for what we really mean to say. Our only power is in arranging them in a way that implies the intangible truths that matter most. Sound is just one of the many stones I pick up when trying to build a space for a reader. So it’s not arbitrary, but I don’t spend nearly as much time thinking about how to put sound into a poem as something like line breaks, pacing, the core philosophy or question of the poem, etc. You are a poet and a filmmaker, making video poems as part of Organic Weapon Arts Video Series. How is the process of filmmaking related to writing a poem? What are you hoping to capture to enhance the poem? Poetry basically taught me how to learn, so now I tend to see everything through the lens of how to put a poem together. The most obvious similarity is the scattered collection process that is followed by chopping, shifting and eventually slow tweaking. Beyond that, I think of all art as a participatory event, so one of my challenges has been how to leave space for the viewer in the way I leave space for readers. When we start shooting again this fall there will be a few different types of videos with slightly different aims for what I hope will happen. This will include videos like what we have up already that focus primarily on a reading of the poem by the author. Other videos will be more video art in approach, which will try to offer different sensory experiences than watching the poet. Playing with incongruence and association between what is seen and heard is something I really hope I can pull of without the video being distracting. In all of the videos my aim is annotate the poem rather than supplement or supplant it. That means I steer away from extremely literal imagery as best I can as well as visuals that turn the poem into background noise (though poems as background is something I’m interested in getting into in future work). I’m not sure my approaches can enhance a poem, so I think of it more as offering another experience. I’ve always been the guy who didn’t feel like a book could be destroyed by a film adaptation. Just as hearing a poem is different from reading it silently while still being related, I hope the videos will add another dimension that the reader/viewer can take or leave. How did you come to poetry? My twin sister encouraged me to try it out after hearing some music I was working on alone in the basement when I was in my early twenties. I eventually challenged myself to get on the list at a local spot and recite my song lyrics with a different cadence. At the time I was working under a philosophy that I guess I still have: I can’t grow if I only do what I know how to do and am not afraid of. I didn’t know how to do poems and being in front of an audience was the scariest thing I could think of at the time, so I threw myself into the fire. When I did, I met a version of myself I hadn’t encountered before and went down the poetry rabbit hole to learn more. I found everybody else there and learned how to be a person that way. Can creative writing be taught? How? Definitely. There are so many skills and tools and grammatical rules and literary devices and rhetorical approaches to communication in the English language that no one person can name them all. They were all created to get us closer to approximating feeling and thought. The arrangement of all this variety is no less teachable than the markings on a schematic. For me, the ideal way to teach creative writing is by examining these craft elements in a non-pedantic way—by having broad and compelling discussions about what’s happening in a piece of writing and what the effects of those choices are. In this way, a writer adds tools to their repertoire like a guitarist adding new chords and strum rhythms to theirs. It’s true that knowing all the chords won’t make someone a good songwriter, but someone with more chords and grooves has more textures at their disposal for rendering their vision. And while vision can’t be taught or gifted, I deeply believe it can be nurtured and inspired. The most vital life lessons are found in our interior lives and instruction in creative writing is probably the most powerful gateway to that inner space one can give a student. In an education system that keeps finding new ways to substitute memorization and regurgitation for cognitive thinking, teaching creative writing may not be just possible, but necessary. What’s your required reading list? Which five books should everyone reading and writing poetry today know? The five that stayed with you when you weren’t currently reading them. The 20th century idea of a set wall of unassailable excellence is useful for a lot of writers to know where they stand in history, but from my experience, it isn’t quite as useful in teaching people to write. If any other poet were to list their five, I can bet any amount of money it won’t contain any of the work that changed me or shaped me into the writer that I am. Also, I tend to think in terms of poems rather than books. The most ground-breaking moments I’ve had as a teacher have come from teaching contemporary work that wouldn’t likely be on anybody’s must read list. I’ve even taught using poems by middle-schoolers. I think it’s actually one of the secrets to why I’ve historically gotten such good writing out of my students. My approach is always to demystify and encourage variety. I feel like saying “everyone of course should read [famous dude]” alienates more than it instructs. There’s so much good writing out in the world that I’d feel like a shill if I presented as though I had objectively narrowed down the absolute best. At the end of the day I always check myself to make sure I’m providing students with what they need to grow rather than setting an agenda or towing a line. What’s the best piece of writing advice you’ve received or your favorite writing quote? What’s your advice for working young writers? I think the most important thing I learned from the Inside Out Literary Arts project was to always treat students like full people. This may seem like a no-brainer, but most confusion about how young people think seems to start with people not seeing them as whole. At IO, they say, “A funny thing happens when you treat a student like a writer, they act like one.” Sometimes people go with the “I just want to get them telling their stories” approach, but from my experience students are more willing to participate when things come from a craft standpoint. They don’t feel quite so lost at sea and it gives space in the class for more than just the most melodramatic students. Also, I’ve found that the more structured an exercise is, the more willing people are to share. 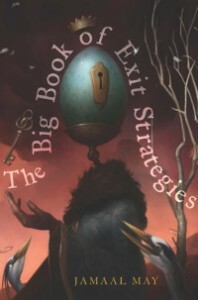 I just turned in the final version of my second book, The Big Book of Exit Strategies (Alice James, Spring 2016). Now I’m turning much of my attention towards projects that have been on the back burner for a while. One is a collaboration with Australian composer Andrew Harrison. I’ve also been getting back to making music (slowly), and I can feel the bits of lyrics and scraps of melodies inching towards each other. Soon I’ll be heading overseas for the first time for a six week residency. I’m expecting to get a lot of work done on the pieces of prose that have been stalking me—some claim to be part of a novel, some insist they’re a book of nonfiction. Jamaal May’s poem, “On Metal,” is very concerned with sound as part of the poem’s content. In what ways does the poet manipulate sound, as well, in his own language? What relationships between the careful sonic work of the poem and the poem’s interest in sounds can you discover? How does “There Are Birds Here” use the technique of negation—that is, describing what is not the case—in order to make its argument? Read “Hum for the Bolt,” and jot down the words you don’t understand. What do these words evoke for you, in the context of the poem, even without knowing their precise definitions? What do you imagine them to mean? Research their definitions and reread the poem. What do you imagine is the “it” the speaker refers to in “Hum for the Bolt”? Using the title, what might you describe as the subject of this poem? 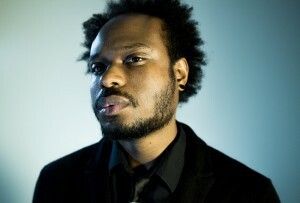 Reread Jamaal May’s Lightbox interview, paying special attention to his musical analogies. What do you make of these? What role does music play in the selection of poems on the website? What are some different ways you might read “I Do Have a Seam”? What changes about the poem when you read it a specific way? Why do you think Jamaal May left these possibilities open for the reader? In his Lightbox interview, Jamaal May writes, “All words are just cardboard cutouts standing in for what we really mean to say. Our only power is in arranging them in a way that implies the intangible truths that matter most.” In this in-class activity, we’ll consider how the conditions of the poem (especially its arrangement on the page) enact a kind of performance for us as readers. Watch Jamaal May’s video poem, “I Do Have a Seam,” from Organic Weapon Arts. Reflect on what the video dimension adds to the poem (found, as a text, here). Now, make your own video poem. Using a phone-camera, computer software, or the equipment and resources of your institution’s library/technology center, create a multimedia video that you believe communicates the performance of your poem verbally as well as visually. This will include videos like what we have up already that focus primarily on a reading of the poem by the author. Other videos will be more video art in approach, which will try to offer different sensory experiences than watching the poet. Playing with incongruence and association between what is seen and heard is something I really hope I can pull of without the video being distracting. In all of the videos my aim is annotate the poem rather than supplement or supplant it. That means I steer away from extremely literal imagery as best I can as well as visuals that turn the poem into background noise (though poems as background is something I’m interested in getting into in future work). I’m not sure my approaches can enhance a poem, so I think of it more as offering another experience. Lightbox Poetry is an online resource for students and teachers exploring the place of poetry in the classroom. We believe poetry has a place not only in creative writing and literature classes, but in all kinds of classrooms—in all disciplines from history to math, and at all levels, from early childhood to lifelong learning. 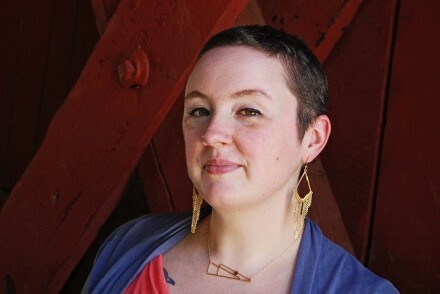 By connecting poets, students, and teachers, we hope to create a space for dialogue about teaching in the growing field of creative writing pedagogy.